The democrat pleaded not guilty and was released on bail Tuesday evening. Amid the post-Hurricane Sandy rubble of Breezy Point and the 24 dead bodies on Staten Island, Pamela Harris — who would later become a state assemblywoman — turned a profit on New York’s pain. “Harris was busy brewing a storm of her own — one that resulted in her receiving significant payouts by the very federal agency charged with helping those truly in need,” said FBI New York field office head William Sweeney Jr. But her Coney Island residence was intact, with officials charging that Harris looted nearly $25,000 from FEMA by filing phony paperwork to cover the cost of a “rental” home and pocketing the cash. She was freed on $150,000 bond Tuesday afternoon, hours after her morning arrest for allegedly looting government funds between 2012 and 2016. “Ms. Harris has been an invaluable community organizer and a well-regarded legislator,” said a statement from her attorneys. “Especially given her background, we are disappointed that Ms. Harris was indicted. She stepped down as head of the Coney Island Generation Gap, a training and mentoring group, in November 2015 when she was elected to the Assembly in a special election. She was reelected the next year. She later marched past a reporter at the Coney Island house without saying a word. The probe was handled jointly by the FBI, the U.S. Attorney’s Office and the city Department of Investigation. “The brazen corruption charged as a result of this investigation tramples on the very definition of a public servant,” said DOI Commissioner Mark Peters. Harris, in addition to her vacation spending, used other stolen funds to pay her lingerie tab at Victoria’s Secret and her bills at Kohl’s, along with paying off the mortgage on her Coney Island home. Another six Lakewood, New Jersey couples were charged Wednesday with welfare fraud, bringing to 26 the number of people implicated since last week in the multimillion-dollar scandal. At the heart of the charges is the allegation that they all, in one way or another, failed to report or otherwise concealed significant income that would have made them ineligible for the assistance programs in which they enrolled. In total, state and federal prosecutors have said the families collected more than $2.4 million in benefits. The Ocean County Prosecutor's Office identified those charged Wednesday as Eliezer, 33, and Elkie, 31, Sorotzkin; Samuel, 45, and Esther, 44, Serhofer; Yisroel, 37, and Rachel, 34, Merkin; Jerome Menchel, 33, and Mottel Friedman, 30; Tzvi, 35, and Estee, 34, Braun; and Moshe, 30, and Nechama, 27, Hirschmann. They allegedly obtained nearly $400,000 in Medicaid, food and heating benefits fraudulently. It wasn't immediately clear if they had attorneys to comment on their behalf. The charges have shaken Lakewood, whose population tripled since 1980 as the Orthodox Jewish population there surged. The town is now one of New Jersey's largest as a result. Among those arrested since the crackdown began are a rabbi and the former director of a religious special-needs school. Yitzchock and Sora Kanarek, Chaim and Liatt Ehrman, and William and Faigy Friedman were arrested late June 27. Prosecutors say the three couples misrepresented their income and then collected more than $674,000 in benefits. Yitzchock Kanarek formerly ran Yeshiva Oros Yisroel, which catered to kids with special needs who could not be accommodated at other religious schools. Four other couples were arrested June 26 for allegedly defrauding public assistance programs of more than $1.3 million in benefits. 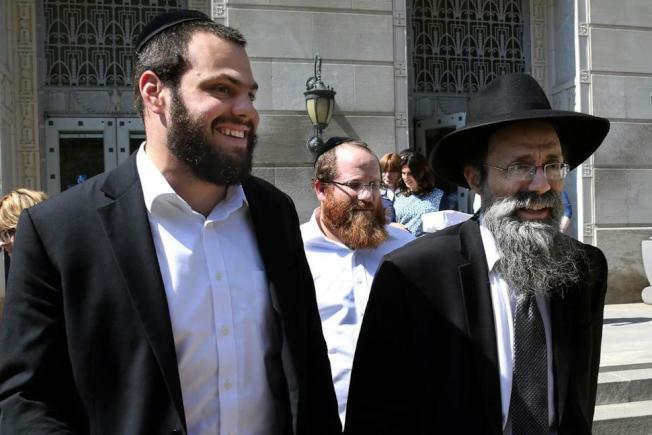 Rachel and Mordechai Sorotzkin face federal charges, as do Yocheved and Shimon Nussbaum. The Sorotzkins allegedly obtained state Medicaid benefits that they did not qualify for, while the Nussbaums allegedly did the same with Medicaid, housing and food assistance benefits. Seperately, Ocean County prosecutors filed state charges against Mordechai and Jocheved Breskin and Zalmen and Tzipporah Sorotzkin. Both couples allegedly underreported income to collect Medicaid, food, housing and Social Security benefits. Zalmen Sorotzkin is the Rabbi of Congregation Lutzk in Lakewood. Last weekend, vandals posted a banner containing an anti-Jewish slur on a Holocaust memorial in front of a Lakewood synagogue. A message on the covering included an ethnic slur for Jewish people and stated they "will not divide us," along with the name of a group supposedly responsible for the covering. The action is believed to be tied to the recent arrests. Prosecutors said Thursday that their investigation is ongoing and more charges may be filed. The specter of more charges has shaken Lakewood. Hundreds of residents have contacted authorities seeking amnesty or help avoiding arrest, the Asbury Park Press reported on June 29. In addition to the hundreds seeking amnesty, dozens more people have contacted social service agencies to cancel their benefits or declare income, the paper reported, citing a law enforcement source who was not authorized to speak publicly on the matter. "Financial assistance programs are designed to alleviate family hardships for those truly in need. My office gave clear guidance and notice to the Lakewood community in 2015 of what is considered financial abuse of these programs. Those who choose to ignore those warnings by seeking to illegally profit on the backs of taxpayers will pay the punitive price of their actions," Ocean County Prosecutor Joseph Coronato said in a June 26 statement. Rabbi Moshe Zev Weisberg released a statement last Wednesday evening on behalf of The Lakewood Vaad (a council of local elders and businessmen), saying the group was "saddened beyond words by the arrests of seven couples in our town. "There is no such a thing as 'justified' theft," Weisberg said in the statement. "To deliberately bend a safety-net eligibility rule is stealing, no different than stealing from your friend or neighbor." Weisberg said the council would launch a set of intensive educational programs in the days ahead, and that the public will be invited to participate in the programs.